Join our celebration to help support May 15th storm recovery! 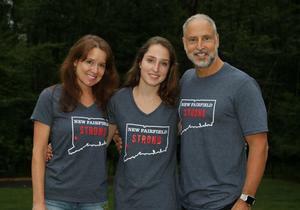 All proceeds to benefit the New Fairfield Storm Recovery Fund. Food, Fun, Music and Dancing! New Fairfield Strong Awards Presented to Top 3 Town Heroes!! 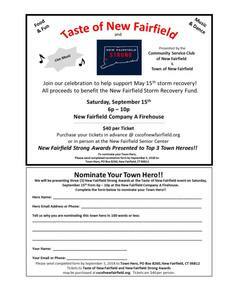 The Taste of New Fairfield is presented by the Community Service Club of New Fairfield and the Town of New Fairfield. To purchase a T-shirt - they are on sale via their website and many wonderful businesses in town are helping to sell.